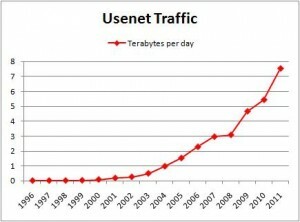 The demise of Usenet has been greatly exaggerated. As a matter of fact, traffic continues to set all-time records, and actually exceeds that of mega-sites like Apple.com (7.9tb).and Google.com (6.4tb). So, how is this happening? While the web has eclipsed Usenet when it comes to discussions, binary traffic has more than made up for the loss. 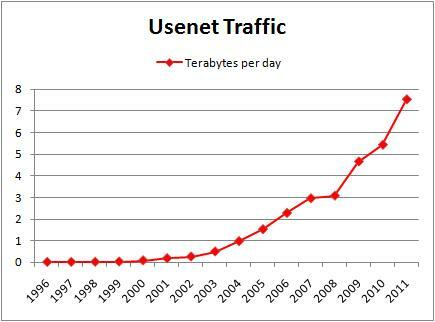 In fact, with the rise of the NZB method of downloading, you could say that Usenet was the Internet’s first functional cloud. As the size of binary files got larger and larger, it became impossible to handle them with traditional newsreader client software. To solve the problem, NZB files were invented, and Usenet search engines sprang to life. Today, freshly-minted Usenet users don’t even look at newsgroups directly, or are even aware of their existence. Their first step is to go to an NZB search engine like Easynews, enter the title of the binary they are looking for, and then download an NZB file containing the “message IDs” of each post. Then they start up an NZB downloader program like Super-NZB, load in the NZB file, and download the binaries at blazing speeds. For all they know, Usenet is just some cloud up in the sky, stuffed with files. While it is impractical to navigate some of the gigantic Usenet binary groups with an old-fashioned newsreader program, the new NZB downloading process is spectacularly efficient. In other words, when it comes to downloading files, Usenet is bigger and better than ever.